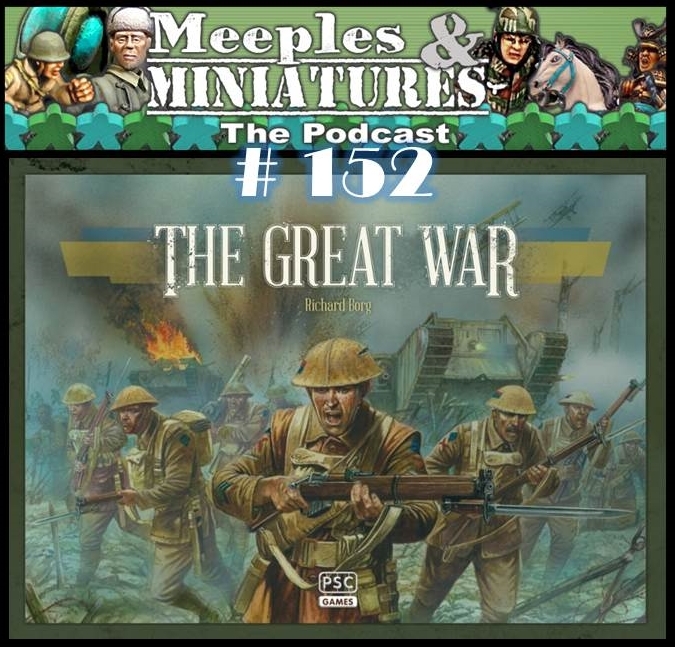 In this show, hosts Neil Shuck and Dave Luff review The Great War, the World War I boardgame designed by Richard Borg and published by PSC Games. Looking forward to listening to this while doing some painting tomorrow after a hard weekend at work! Thanks for an enjoyable show. Despite being intrigued by the C&C concept, not tried any incarnation yet. I doubt this is the one to try for me, but I am planning getting Memoir 44 for my eldest son this Christmas. Thanks again. Interesting review there Neil, and in the August issue of Miniature Wargames. I do think though that the Chain of Command variant for Through the Mud and the Blood (from the Lardies) will scratch the WW1 itch for me, I just think it has more depth. Listening to your review reminded me of the old SPI game Patrol (long before your time but I expect Silverback Whitaker will remember it!). It had a WW1 solo scenario (basically a learning game I think) where you controlled your figures moving from one end of the geomorphic board to the other. The opposition were represented only by random attacks against you determined by the hex number your figures were on as they progressed across the map. Your force was inevitably whittled away as losses mounted. If any of your figures survived to the map edge then you “won”, as your figures had reached the enemy wire although they were adjudged to then perish. A sobering game indeed. Meeples Bunker that would be Mike…. Thanks for that. Great show. Very interesting. My seven year old son and I saw this at Bovvy show and it really grabbed our attention. He’s pushing for Santa to bring it to me for Crimbo. I’m not sure that it’ll hold enough of his attention. He’s young but he plays the boardgames Mission Command: Land, and :Sea, Gladiators, Basic Impetus/Baroque, Impetus and Die Kriegskunst (SYW General de Brigade) so he’s not exactly a newbie to gaming. He likes lots of dice rolling and this has given us both something the chew over. Thanks again chaps.